What Is So Special About Samsonite Luggage? Samsonite luggage is one of the best know luggage brand in the world today. There is no one reason for Samsonite popularity. It’s a combination of factors that make Samsonite such a strong and successful brand. Samsonite offers stylish high quality luggage at compatible prices, suitable for wide range of travelers. Samsonite bags are designed to fit the demands of frequent travelers. On the basis that if it is good enough for frequent travelers it is good enough for most travelers. This is why Samsonite bags are popular among wide range of travelers. You can find business travelers rolling their Samsonite spinner luggage around looking for the VIP lounge, as well as busy families with their Samsonite luggage sets. There are people travelling with Samsonite suitcases as well as Samsonite backpacks. Simply put, there is no typical Samsonite customer. Anyone can find a Samsonite bag to fit his or her travel needs. Samsonite operates very strict quality controls to ensure their products meet the highest quality standards. Their multi-step quality control system employs custom-made testing equipment to test the durability, strength, and reliability of the fully loaded product. The hardware is meticulously tested as well as the strength of the fabric. Handles are pulled and flexed thousands of times, zippers are forcefully zipped, wheels are rolled for miles over demanding terrain, etc. This video shows the thorough quality process that Samsonite bags are put through. While the video is dated, the quality standards remain as rigorous as ever. This meticulous quality control means you are unlikely to experience any manufacturing problems with your Samsonite luggage. However, in the unlikely event of problems caused by manufacturing defects (workmanship or material), Samsonite will either fix or replace the product in accordance with the product warranty terms and conditions. Samsonite is one of the biggest luggage brands in the world and they want to stay there. Product innovation is therefore vital part of their strategy, i.e. to adapt swiftly to any changes in travelers needs / behavior and quickly implement any new luggage technology. This video demonstrates how quality and product innovation is vital part of Samsonite success and strategy. Check out the suitcase torture chamber and how many (or few) pellets are required to make a Samsonite bag these days. 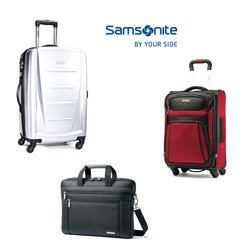 Samsonite bags are designed around frequent travelers needs. Practicality is therefore important design feature... but not at the expense of style. Samsonite has its own distinct style, which is without a doubt one of the reason for their popularity. The colors are usually deep solid colors and the design classic but stylish. Travelling with Samsonite is travelling with style. Samsonite offers one of the widest luggage ranges of all the major luggage brands. Whatever type of luggage you are looking for, Samsonite is likely to have it. There are Samsonite suitcases and luggage sets, Samsonite spinner luggage, Samsonite briefcases and laptop cases, Samsonite backpacks, etc. There are hard sided Samsonite bags, as well as soft sided pieces. There are small Samsonite bags as well as huge ones and of course lots in between. There are various extra lightweight options... basically you are spoilt for choice. Amazon offers wide range of Samsonite products. These are just some of B for Bag favorites. Does The Luggage Brand matter?